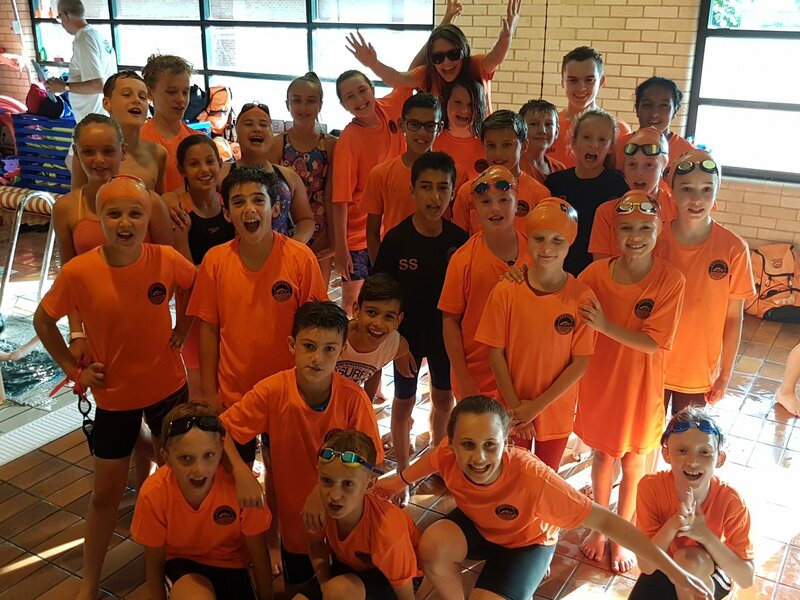 On Saturday 7th July 2018 Cheshunt Swimming Club’s Junior swimmers swam in the final round of this year’s Peanuts League. Yet another remarkable performance saw our swimmers finish in 1st place on the night; this result saw us crowned champions of Division 2. The third round saw 10 year old Darcey McMullins make her debut in the competition. Igor Mordeja brought home our opening 1st place on the night in the U/12 50m freestyle (31.82),he then followed this up in the U/12 25m butterfly (17.68) and the U/13 50m freestyle (32.80). Other individual 1st places were achieved by Charlotte Williams, U/13 50m backstroke (37.36) and U/13 50m freestyle (31.42), boys captain Jake Evans U/13 50m backstroke (36.72), Isabel Mullings 9 years 25m breaststroke (23.28) and Grace Sofokleous-Ames U/11 25m backstroke (19.96). Individual 2nd places were achieved by Daniel Williams in both the U/11 25m freestyle (15.72) and 25m breaststroke (21.78), Emily Pickard U/12 50m backstroke (39.64), Kai Fellows U/12 50m backstroke (40.70) and U/11 25m backstroke (19.26), girls captain Simran Misir U/13 50 breaststroke (41.80), Isabel Mullings 9 years 25m freestyle (18.16), Sasha Coltman U/11 25m butterfly (18.06) and U/12 25m butterfly (18.30), Julia Brodowska 9 years 25m backstroke (23.48) and Max Uroda in the 9 years 25m backstroke (22.30) and 25 breaststroke (25.60). Individual 3rd places were also won by Max Coltman U/13 50m breaststroke (44.62), and Kai Fellows U/11 25m butterfly (18.72). Other notable individual swims came from Oliver Thompson 9 years 25m freestyle (20.80) , Darcey McMullins U/11 25m freestyle (16.91), Nicole Vecere U/11 25m breaststroke (23.40), Natalia Brodowska U/12 50 freestyle (36.82) and Sam Safavizadeh U/12 50m breaststroke (49.70). The relay team of Jake Evans, Max Coltman, Igor Mordeja and Harry Brunton came 1st in both the U/13 individual medley relay and freestyle relay. The U/13 freestyle relay team of Charlotte Williams, Victoria Townsend, Ashlee Willet and Simran Misir came 2nd as did the U/11 boys freestyle team of Daniel Williams, Kai Fellows, Alfie Bullock and Luke Pickard, the boys also finished 3rd in the medley relay. Other 3rd place finishes were achieved by the girls 9 years freestyle team of Isabel Mullings, Lara Townsend, Alex Papciak-Wrona and Julia Brodowska and the boys U/12 team of Sam Safavizadeh, Igor Mordeja, Antonio Torrpo and Kai Fellows in both the freestyle and medley relays. The final race of the night saw our squadron team of Isabel Mullings, Max Uroda, Sasha Coltman, Kai Fellows, Emily Pickard, Igor Mordeja, Charlotte Williams and Jake Evans just pushed out to 2nd place in what was an exciting league finale. This year’s Club AGM will be held on the 24th June at The Laura Trott Leisure Centre between 4.15pm and 6pm. We would like to encourage as many parents as possible to attend as ultimately this is your club and we would like you to have a say in how it’s run. We are always looking for people to help out so if you think you can help, even in the smallest way with the running of the club, please speak to any member of the committee or the coaching team. Nomination of officials need to be with Suzanne at secretary@cheshuntsc.co.uk by 17th June 2018. As a club we do rely on the goodwill and help of parents. We extend huge thanks to those that are stepping down from their roles. There are a lot of things that need to be done behind the scenes and the more parents who are willing to help then the better it will be for the swimmers. We are particularly looking for parents to join as our Vice Treasurer, Fixtures Secretary and Welfare Officer which are vacant. At the moment these jobs are being covered by other committee members and parents but we would welcome help from parents of younger members of the Club. Please speak to a committee member or email Suzanne at secretary@cheshuntsc.co.uk if you think you could commit to any of these roles. The opening round saw Peanut’s League debuts from; 9 years old’s, Mya Wright, Alexandra Papciak-Wrona, Isabel Mullings, Lara Townsend, Max Uroda and Oliver Thompson, 10 year old Alfie Bullock, 11 year olds Phoebe McGreal, Antonio Torrpo and 12 year old Harry Brunton. The Girls’ Junior Club Captain Simran Misir brought home the teams opening 1st place of the night in the U/13 50m breaststroke (41.01), this was followed by Igor Mordeja in the U/12 50m Freestyle (32.10), Igor also finished 1st in the U/12 25m butterfly (17.22). 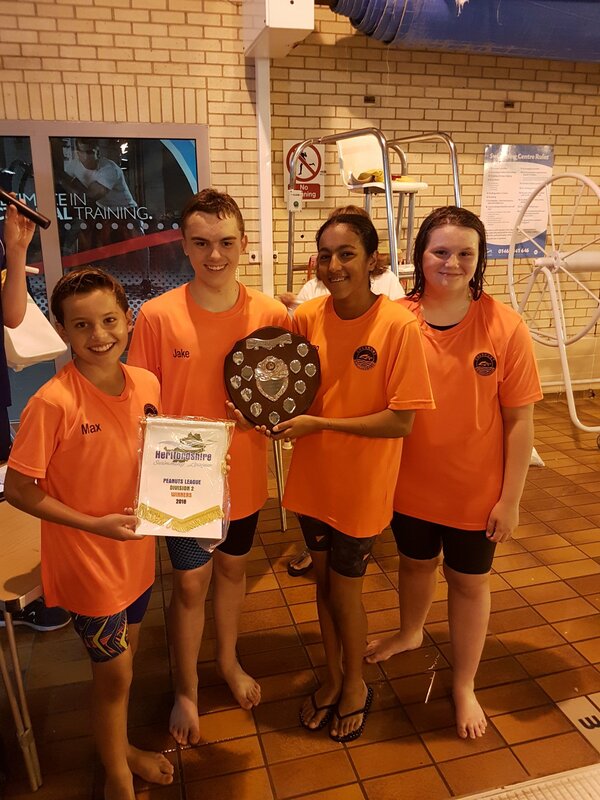 Other individual first places were achieved by Max Uroda 9 years, 25m backstroke (23.84) & 25m breaststroke (25.80), Daniel Williams U/11 25m breaststroke (23.48), Charlotte Williams U/13 50m freestyle (32.52) & 50m butterfly (36.07) and finally the Boys' Junior Club Captain Jake Evans in the U/13 50m butterfly (37.45). Individual 2nd places were achieved by Natalia Brodowska U/12 50m backstroke (41.38) & 50m freestyle (36.56) and Isabel Mullings 9 years 25m breaststroke (25.13). Individual 3rd places were also achieved by Sasha Coltman U/11 25m freestyle (17.38), Max Coltman U/13 50m breaststroke (44.39), Oliver Thompson 9 years 25m freestyle (22.24), Harry Brunton U/13 50m freestyle (38.18) and Phoebe McGreal U/12 50m breaststroke (49.46). The relay team of Jake Evans, Max Coltman, Igor Mordeja and Harry Brunton came 1st in both the U/13 individual medley relay and freestyle relay. 2nd place finishes in the relays were also achieved by Lara Townsend, Isabel Mullings, Mya Wright and Alexandra Papciak-Wrona in the 9 year freestyle and special relays, Grace Sofokleous-Ames, Nicole Verce, Sasha Coltman and Isabel Mullings in the U/11 freestyle relay. The U/13 team of Victoria Townsend, Simran Misir, Charlotte Williams and Natalia Brodowska finished 2nd in the individual medley and 3rd in the freestyle relay, there were also 3rd place finishes for Igor Mordeja, Daniel Williams, Antonio Torrpo and Alife Bullock in the U/12 freestyle and individual medley relays and Natalia Brodowska, Grace Sofokleous-Ames, Fresia Radzi-Goldsmith and Phoebe McGreal in the U/12 individual medley relay. The final race of the night saw our squadron relay of Jake Evans, Isabel Mullings, Max Uroda, Sasha Coltman, Daniel Williams, Natalia Brodowska, Igor Mordeja and Charlotte Williams standout when they stormed home to finish in an emphatic 1st place. Coach Richard Walker said that it was a very good night for the team. 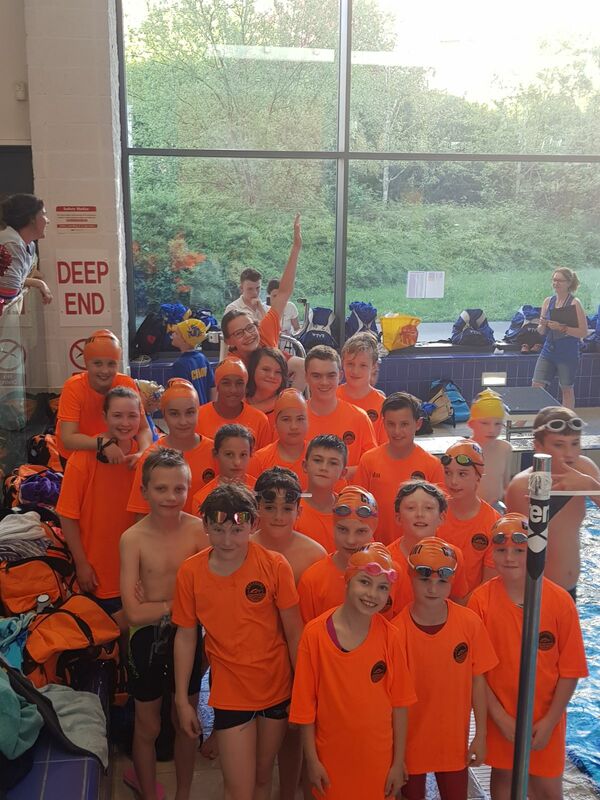 Credit to all Cheshunt swimmers who swam their hearts out but particular congratulation has to go to all those swimmers making their first appearance in the Peanuts League, I know that there were a few nerves but none of them showed when they were in the water. We have a lot to be positive about going forward, hopefully in the next couple of rounds we can do even better. Last weekend saw masters swimmer CLaire Massey compete at the East Regional Masters Championships in Newmarket. Claire came away with 2 golds in the 50m Butterfly and 100m Backstroke, Silver in the 50m Backstroke (beaten by 0.1 second) and 7th in the 50m free. Well done Claire! The Welsh Nationals were held in Swansea from the 31st July until the 6th August. 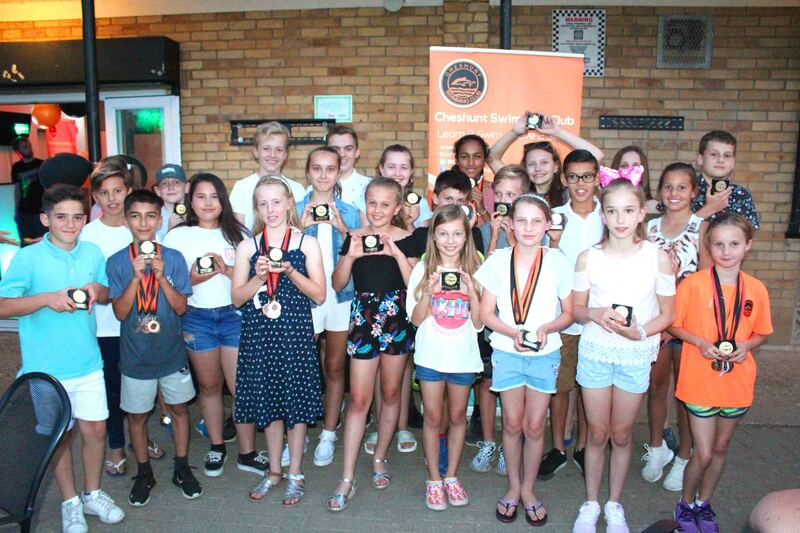 This year Cheshunt had 3 swimmers competing, Zane Batt plus Tegan & Callum Wollaston. Between them they would be swimming 32 events over the 7 days. Monday saw the boys first in the pool with 100m FS. Zane started off as he intended with a PB of 1.02.56 finishing 14th. Callum also set a PB of 57.06 in the heat which got him into the final in which he finished 4th. The 200m BK was also a strong event for the boys with both making the finals. Zane finished 5th in a time of 2.27.27 and Callum set another PB in 2.21.44 again in 4th place. Tegan joined the boys on day 2 with a great seasons best time of 2.14.99 in the 200m FS coming 14th. Zane swam a PB of 38.10 for the 50m BR and Callum came 10th in the 100m FLY in 1.04.60. Wednesday saw the boys in the 200m FS. Zane set another great PB of 2.17.58 coming 14th with Callum doing the same in the heat with 2.04.69 and just missing out again on a medal in the final with 4th place. Thursday hotted up with a second session before the finals. Zane set 3 more PBs in the 100m BR 1.25.75, 200m IM 2.38.61 and 400m FS where he swam a brilliant race coming 10th in a time of 4.46.88. Likewise Callum set high standards with PBs in the 200m IM just missing out on the final in 9th place, and again showing his strength in the 400m FS event getting on the podium in 3rd place in 4.26.81. Tegan also swam a seasons best in the 100m FS 1.03.73 and 400m IM 5.36.31. Session 1 on Friday saw the 50m FS with Zane in great form with a PB of 28.87 and Callum yet again just missing out on the final with a PB of 26.84. Tegan also impressed with her 100m FLY and 200m BK. The 2nd session saw the 400m FS for Tegan and 400m IM for Zane. Both finished 11th in times of 4.49.83 & 5.33.69. Saturday morning saw Callum gain his favourite position of 9th in the 50m FLY 28.83 but both Zane & Callum progressed through to the final of the 100m BK. Tegan also swam a great 800m FS finishing in 9.44.10 taking 7th place. The finals session on the Saturday saw both Zane & Callum step a level in their finals and lower their PBs with Zane 2nd in 1.05.78 & Callum 3rd in 1.04.25. The final day of competition saw all 3 swimmers in the pool. The 50m FS saw Tegan with another seasons best of 29.51 and again both Zane & Callum progressed to the final in the 50m BK. Not to be outdone Tegan also qualified for the final in the 200mFLY. Inbetween the heats and finals both boys were involved in the gruelling 1500m FS. Zane was first up and set out on a good pace. He continued to grow in strength through the race and finished in a brilliant PB of 18.52.11 only just missing out on a medal by less than a second. Callum was next up and seeded in 3rd place. He went out strongly and had to swim the race on his own as by 200m he was 2 body lengths in front. He continued to pace the race well and finished strongly in a great PB of 17..22.62 taking the gold medal. The final finals session saw Zane & Callum again in the pool in the 50m BK. Both boys yet again finished with new PBs of 31.17 & 30.34 just missing out on medals with both in 4th place. Tegan lowered her heat time in the 200m FLY coming 6th in 2.44.02. The whole week was a tremendous success with 20 PBs and 4 season best times out of the 32 events swam by the Cheshunt swimmers. It was also great to be joined by Henry Roberts (Hertford), Daniel English (Hitchin), Ceri Heard (Watford), Anna Fallon (Team Luton) and Jessica Keogh plus Gemma Hanson (Hatfield), all of whom swam a variety of events over the 7 days.